Committing to a New Year’s resolution is a favourite blog topic of mine. I’ve written a post about it for the past couple of years because I really like to share what I’ve learnt about goal setting, and what we fickle humans need to do, to really stick to our commitments. The reality for just about all of us, is that New Year’s resolutions are really difficult to stick with. So many other aspects of our lives just get in the way, sometimes we also experience crises in our lives which throw us off track. The best way to ensure our greatest chance of success is to be realistic about what we can achieve. 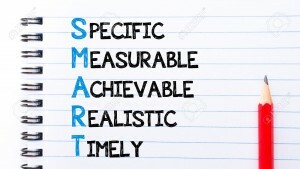 When I worked in corporate life I learned about SMART goals. They are: Specific, Measurable, Achievable, Realistic and Timely. There’s actually a few different versions of “SMART” but this is my preferred one. In order to achieve a goal it needs to be very specific. ‘I will ride my bike more’ is not specific but ‘I will ride my bike 150 km per week’ is very specific. The latter is much more likely to be achieved because it can be measured. Setting a goal like riding a certain number of kilometres or hours per week is really easy to measure with a bike computer. Even the most basic one will achieve it. I’ve always trained with a dedicated computer on my bike and enjoy looking at my post-ride stats. It also allows you to see if you are improving your times. There’s no point in deciding you will ride 200 km per week if you don’t have the time in your busy schedule. You are much better to commit to 100 km per week and actually achieve that goal first. Perhaps you can increase it later. I’m not suggesting you should stay completely within your comfort zone. You should actually challenge yourself and make your goal a stretch, but you should also be realistic about it. If you contract an illness then you should rest rather than push too hard. If you have to spend extra hours at work then you should adjust accordingly. Giving your goal a timeframe will also make it easier to achieve. Riding 150 km per week has a very obvious timeframe but if you’re training for a specific event then you might increase your usual riding for a limited period of time. A great way to commit to a goal is to share it with others. So here is my resolution. Hopefully this will make me more accountable. I belongto Wheel Women and try to get out at least weekly on their rides. Happy blogging and enjoy reading them..